Several polls show that support for President Obama among the millennial generation has plummeted. Analysts have offered several reasons, including disenchantment with his healthcare initiative and declining trust in government. But one study says the actual fault-line among millennials is a familiar one: race. Depending upon which poll you read, Obama's most recent overall approval rating among young voters is between 47% and 53% — not disastrous, but not very good either, especially since, in 2009, his approval rating was hovering at around 60%. As the mid-term elections draw closer, the White House has endeavored to regain some of its lost popularity. "For the better part of four or five years, young people have been the outliers. They've been the folks who have been the most optimistic and most trusting of the president and Congress to actually solve the problems they most care about." Della Volpe said, explaining what happened. "You have a combination of two things. One is: Expectations [were] incredibly high—not just for the president but for Washington and adults in general—that have been unmet," he said. "And then the second part of it is, you can see that there are very few aspects of the healthcare initiative that they approve of. They think quality will decrease, prices will increase. So it's not surprising that that is taking a significant hit to the president's approval ratings." As a candidate, Barack Obama was incredibly popular among millennials, but even as far back as 2008 perceptions of candidate Obama varied considerably by race and ethnicity. While 65 percent of white millennials viewed Obama favorably during the 2008 campaign, an even greater number of non-white millennials (87 percent) expressed a favorable view of him. 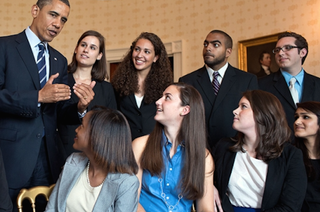 More recently, millennials have become increasingly divided in their perception of Obama. A 22-point favorability gap in 2012 between white and non-white millennials has ballooned into a 34-point gap in 2014. Even before the start of Obama's second term, there was evidence that he was faltering among young white voters. In 2008, he captured the majority (54 percent) of younger white Americans votes, but fewer than half (44 percent) cast votes for him four years later. Notably, black and Hispanic millennials supported Obama as strongly in 2012 as they did in 2008. Millennials are an incredibly diverse generation. As such, they are more likely to interact with and display greater tolerance toward minority groups such as atheists, immigrants, Muslims, and gay and lesbian people. They are also more comfortable with the sweeping cultural and demographic changes affecting the U.S., for which they are in no small part responsible. But, despite being dubbed the "Kumbaya generation," racial and ethnic divisions that define much of American politics and public life persist among millennials. Nearly half (45 percent) of white millennials, for instance, believe that discrimination against whites is now as big a problem as discrimination against blacks and other minorities while only 34 percent of non-white millennials agree. Still, Cox notes that the gaps between white and non-white millennials are considerably smaller than the "chasm" that divides seniors. "Even as it seems clear that race will continue to play an outsized role in U.S. culture and politics, there are signs that millennials may navigate some of these issues quite differently than previous generations."